Acne can't be cured, with or without a prescription. Even after blemishes disappear, you must continue to use an effective acne treatment to keep new blemishes from forming. 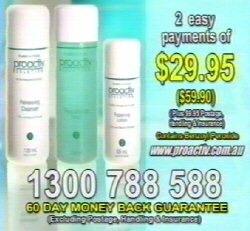 The expert dermatologists at Proactiv Solution have created a breakthrough way to treat acne safely and effectively. Combination Therapy® uses several different medicines in one system to heal the blemishes you have now and help keep new ones from forming. Proactiv Solution is a Combination Therapy® acne management system - it combines prescription-grade ingredients in a system that works together to heal and prevent acne. Developed by two Stanford-trained dermatologists, the unique acne fighting system combines finely milled benzoyl peroxide, sulphur, and their special formulation. These ingredients gently exfoliate your skin, unplug your pores, attack acne-causing bacteria, and soothe inflammation. Many of the acne medications you buy at the store are "spot treatments," designed primarily to get rid of existing acne, one pimple at a time, with harsh creams that can cause redness or irritation. Gentle and effective, doctor-developed Proactiv Solution is designed to be used on the whole face (or acne-prone area) everyday. It gets rid of existing acne - and proactively helps prevent future breakouts before they even surface on your skin. Since it's formulated with soothing botanicals like allantoin, panthenol, aloe and chamomile, it leaves your skin feeling healthy and hydrated... instead of dry and flaky. Renewing Cleanser: gently exfoliates your pores and allows the benzoyl peroxide to penetrate. Revitalizing Toner: helps unclog your pores and remove dead skin cells. Repairing Lotion: allows delivery of benzoyl peroxide deep into your pores to attack acne-causing bacteria at the source. Proactiv Solution also offers a Refining Mask that boosts the effects of your 3-Step System. This cool, soothing formula includes sulfur to refine pores and help heal existing acne more quickly. Work it into your skin care routine 2-3 times per week for even more acne-fighting power.